When Carmelo Anthony sunk a game-winner in Memphis to give the Knicks their sixth win in his first nine games, life was very good. The masses were excited about where the Knicks were headed. Anthony and Amar'e Stoudemire were making sweet music on offense, the team was playing enough defense to let their superior offense carry the day and dreams of fifth playoff seeds were dancing in our heads. And even if they couldn't pull that off, the struggling Heat made you feel like a Knicks upset in the first round was something that could easily happen. All of that was going on just over a week ago, so why does it feel like the memories of those days are in black and white? Sadly, it's an easy question to answer. The way the Knicks have played in losing three games since Anthony's big shot has been so rancid that coming up with positive spin feels like doing PR work for Stalin's agricultural policies. There's nothing good to say about the team's abysmal defense or absent effort. 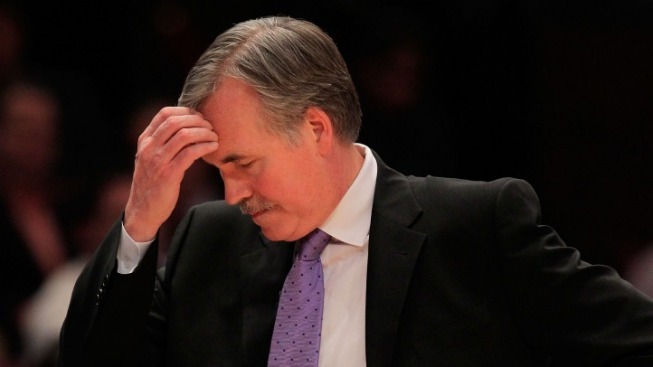 Mike D'Antoni can complain all he wants about the difficulties created by the Anthony trade, but it doesn't absolve him of his bizarre substitution patterns and lineup choices. Anthony is complaining about D'Antoni's schemes, which would feel a lot more justified if he were willing to play within them on either side of the court, and there's a pall over the entire team that makes you wonder if it is just a matter of everyone getting more comfortable with each other. If all that isn't enough to make you sick to the stomach, the whole thing is made worse by the fact that both the Nuggets and Nets have been cruising since deadline day. Both teams are gloating about how strong their roster is because Anthony isn't a member of it, something that only hurts because it appears to be true. Right now, Knicks fans have to cling to the notion that the team is going to be able to gel and turn things on when they get to the playoffs. That's a nice thought, but it isn't one that's going to survive too many more nights like the ones against the Pacers. The Grizzlies are in town on Thursday night and that would be an awfully good time for the Knicks to show that they are willing to work hard enough to make good on those heady dreams in early March. In a way, all of this represents a step forward for the Knicks. Last year no one cared that the Knicks played dispassionate basketball without any thought about the defensive end of the floor. Now it is an affront to the city, which shows how much minds changed about the team over the first three-quarters of the season. Just as we had to remember how to root for a winner, now we have to remember how to weather storms that come with having expectations for a basketball team.